The most common argument I’ve heard over the years for why we should allow Christian “pop” music in Church is the consequentialist or utilitarian argument: “Look how well it works. It gets people to Mass and keeps the youth involved.” Interestingly, I’ve never heard a Catholic try to defend the folksy or pop-style music on purely artistic or liturgical grounds, and only rarely have I seen Protestants try to do that. The baseline for the entire discussion seems to be a rough-and-ready pragmatism. The problem with this argument is twofold. First, even on a practical level, it’s not really true, or very unevenly so. The total number of Catholics attending Mass is in steady decline and has been for decades, especially in the category of young people. The music we have cobbled together after the Council just doesn’t seem to be so appealing, broadly speaking, as to turn the tide. It seems to put off as many people as the number it may appeal to, if not far more. Second and more importantly, a popular style of music, complete with guitars and pianos and that distinctive rock-ballad or easy listening feel, is not at all compatible with the Church’s understanding of the Mass as a true and proper sacrifice offered to God. Let’s admit (for the sake of argument) that we could pack a building full of people by using that kind of music. Would this music be able to convey to the worshipers what the Mass actually is, how they should be disposed to it, and how they should think of what they are doing? Or would it subtly or openly inculcate a different doctrine that would eventually result in heterodoxy? There’s a lot that can be said and has been said about these matters, but it seems to me that one helpful approach is to ponder certain passages of Pope Pius XII’s great encyclical on the sacred liturgy, Mediator Dei, which was a major source for the authors of the Second Vatican Council’s Sacrosanctum Concilium, and to use its insights to illuminate the issues at hand, which are not issues peculiar to our time but ones that arise in every age where secular music has invaded the sanctuary. I will offer the quotations and, after each, make some comments. 47. The entire liturgy, therefore, has the Catholic faith for its content, inasmuch as it bears public witness to the faith of the Church. 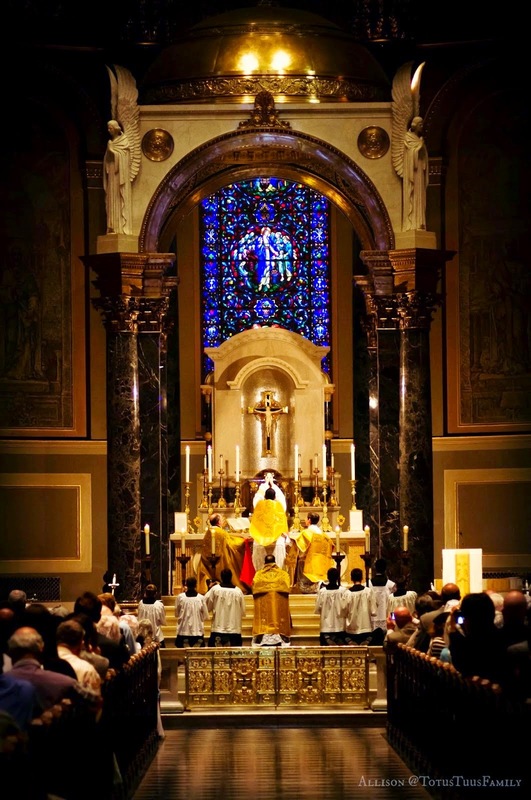 Note well: the entire liturgy has the Catholic faith for its content. This entirety, then, includes the music of the liturgy, in both its words and its strictly musical attributes. Pope Pius XII is saying that the texts, melodies, rhythms, all of these should bear public witness to the Church’s faith. It comes as no surprise that Pius X, Pius XI, Pius XII, Vatican II, John Paul II, and Benedict XVI pointed to Gregorian chant and polyphony as pinnacles of this public witness, and underlined the need for new compositions to imitate the spirit of these exemplars. 68. The august sacrifice of the altar, then, is no mere empty commemoration of the passion and death of Jesus Christ, but a true and proper act of sacrifice, whereby the High Priest by an unbloody immolation offers Himself a most acceptable victim to the Eternal Father, as He did upon the cross. “It is one and the same victim; the same person now offers it by the ministry of His priests, who then offered Himself on the cross, the manner of offering alone being different” (Council of Trent). The Mass is not a social gathering with a humanitarian aim, it is not even a symbolic drama in which we play-act the death of Jesus. It is a true and proper sacrifice, the unbloody re-presentation of the sacrifice of Calvary. Our Lord Jesus Christ’s once-for-all immolation on the Cross is made present and active for us sinners, who would otherwise be lost forever. He comes to be present in this awe-filled, world-changing, life-shaking, heaven-rending sacrifice. For our part, do we appreciate what is happening on the altar? Do our actions, attitudes, responses, artistic expressions, accurately convey our interior awareness of this great mystery, before which we should fall in total self-abnegation, profound humility, trembling adoration? Or does the music (for example) lead us to feel, think, and act as if this mystery and miracle wasn’t happening? 152. While the sacred liturgy calls to mind the mysteries of Jesus Christ, it strives to make all believers take their part in them so that the divine Head of the mystical Body may live in all the members with the fullness of His holiness. Let the souls of Christians be like altars on each one of which a different phase of the sacrifice, offered by the High Priest, comes to life again, as it were: pains and tears which wipe away and expiate sin; supplication to God which pierces heaven; dedication and even immolation of oneself made promptly, generously and earnestly; and, finally, that intimate union by which we commit ourselves and all we have to God, in whom we find our rest. “The perfection of religion is to imitate whom you adore” (St. Augustine). Does our music convey that we are falling down in worship before the all-holy Lord, the God of heaven and earth—the serving of whom leads to eternal life, the offending of whom leads to eternal death? And is this God truly an aweful mystery for us, in our midst, or has He been domesticated into a kind of friendly atmosphere within which our self-referential ceremonies take place? Are the souls of the people like altars of immolation? Is the unspeakably pure and demanding holiness of God the dominant note of what we are doing and singing?